We know that folks may need a few weeks to decide what fabric they want to use for the quilt-along and get it shipped to them if they are ordering it online, so we wanted to make sure you had the fabric requirements for the quilt far enough in advance. And check it out, we started a Drunkard's Path QAL Flickr group so that we can all get to know each other and you guys can share pics of your fabric selections and progress as we get going! Haven't picked my fabric for this QAL yet so this is from my earlier quilt! As I mentioned in my block tutorial, the templates that I made use 5" fabric squares, so if you have charm squares, now is a great time to use them! 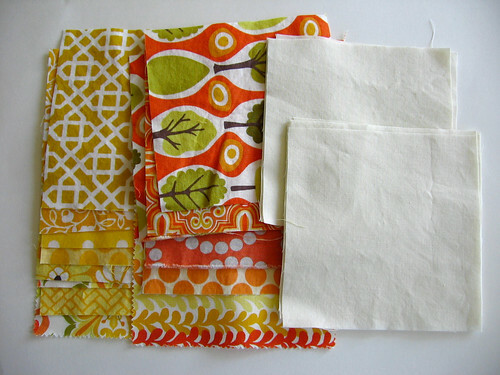 You can also cut your own 5" squares to use from a layer cake of 10" squares (makes 4 charm squares per layer cake piece), from fat quarters (makes 12 charm squares), or from yardage (56 charm squares in a yard of fabric). Elizabeth from Oh, Fransson! 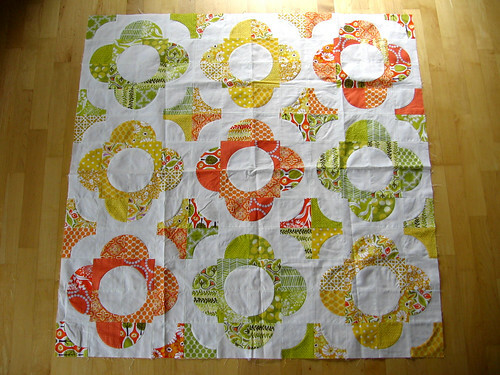 has a tutorial for cutting charm squares from yardage that you may find helpful. 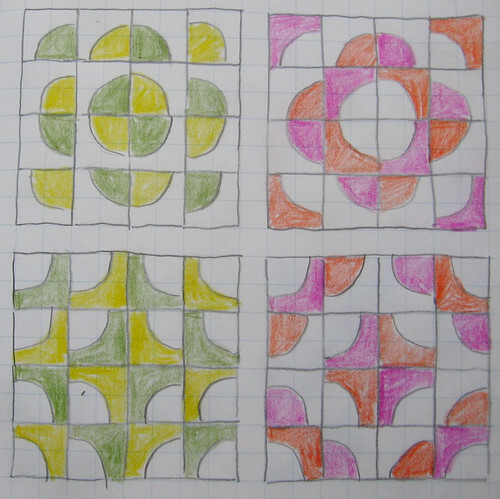 The drunkard's path quilt design is made up of larger blocks made up of 16 of the smaller blocks; using my block tutorial, each of these larger blocks will measure 15" square. For each larger square you will need a total of 16 charm squares, 8 of the patterned/colored fabrics and 8 of your contrasting solid (off-white in my quilt top above). For my central park quilt, I used nine of the larger blocks to make a 45" square quilt, which you can think of as either a large baby quilt or a small lap quilt. For a smaller baby quilt, you could make just four blocks, making a 30" square quilt - which you could also add borders to and make it a bit bigger if you wanted. I'll provide the fabric requirements for both of these sizes, but if you wanted to make a larger quilt, you should be able to figure out how much fabric you need pretty easily! The one tricky part of this is that the amount of fabric you will need depends a bit on the design that you are planning to use... Kristie and I will both be posting more about the different design options with this quilt next week (and Kristie had some more awesome inspiration pics up in her fabric requirements post today), and you can check out my earlier post (with lots more drawings like the one above). Cutting both pattern pieces out of a single charm square, like I have you do in my tutorial, will only work out right if you are going to use both the inner and outer curve piece from that charm, like you would in the pink/red designs above. If you are planning to do a design like in the yellow/green designs above where your patterned/colored pieces are all inner or all outer curves, you will need more fabric and the cutting will be a bit more involved. Thank you!! !I´ll go choose my fabrics. Hi! Your earlier quilt is so beautiful! I just lover those soft autumn colours and and the drunkard's path is great! For the larger one, isn't it 72 charms? I hit post too quickly. I'm going to hunt down some fabric from my stash for this one. I have a few too many charm packs that are just waiting for a project. I'm totally late on this one but I couldn't afford the fabric until I got my birthday money! Anyway, bought it today, just finished drying it and wondering how many 5" charm squares I would need for a queen sized quilt or a twin quilt? I'm debating between the two. Emily - I haven't done those calculations, but you should be able to do the math for whatever size you want to make based on the info above (16 charms - 8 pattern and 8 solid/contrast- makes a 15" square). Hope that helps and good luck with your quilt!